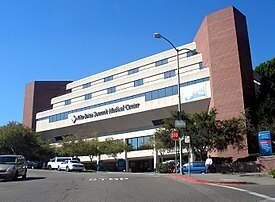 Alta Bates Summit Medical Center is a hospital located in the East Bay of the San Francisco Bay Area. Its three campuses are located in Berkeley (Alta Bates Campus, Herrick Campus) and Oakland (Summit Campus). Alta Bates Summit is a non-profit community-based medical center and is part of the Sutter Health network. The flagship Berkeley campus of the hospital was named after Alta Miner Bates, the nurse who founded the hospital in 1905. Until its affiliation with Summit Medical Center, the hospital was known as Alta Bates Hospital and later Alta Bates Medical Center. Bates was a prominent early California nurse anesthetist. The first graduate of a nurse training program in Eureka, California, she was among the first female anesthetists in the San Francisco Bay Area, administering over 14,000 anesthetics during her career. Until her retirement in 1949, Bates served as the hospital's director and was president of its board. In 1904, Dr. LeRoy Francis Herrick, a graduate of the Kentucky College of Medicine (1893), purchased a Berkeley mansion known as the Hume House, located on the same block upon which the current Herrick Campus is situated, between Dwight and Channing Ways, and Milvia and Grove (now Martin Luther King Way). He converted the large home into a 25-bed hospital which he chose to name for President Theodore Roosevelt whom he admired. (President Roosevelt was an early proponent of a government-supported national public health system.) The Roosevelt Hospital was expanded to 50 beds by 1924, and renamed Berkeley General Hospital. In 1932, Dr. Herrick died, and his heirs converted the hospital into a non-profit corporation. By 1934, the hospital had 100 beds. The original Roosevelt Hospital building was demolished to accommodate additional wings and facilities which were added over time. In 1945, the hospital was again renamed Herrick Memorial Hospital, in honor of its founder. Further improvements and expansions continued through the ensuing decades until its merger with Alta Bates Hospital in 1984. The Summit Campus was previously three separate facilities in the same "Pill Hill" neighborhood immediately north of downtown Oakland: Providence Hospital (founded in 1904 by the Sisters of Providence), Peralta Hospital (founded by local Oakland doctors in the 1920s) and Samuel Merritt Hospital. Dr. Samuel Merritt (1822–1890) was a successful San Francisco physician and also the 13th mayor of Oakland, California from 1867-69. In 1867, Merritt donated to the city of Oakland the wetlands now known as Lake Merritt. Merritt left plans for a hospital and nursing school to be built in his name after his death; in 1909 Samuel Merritt College (still in operation as Samuel Merritt University and affiliated with Sutter Health) and Merritt Hospital opened. ^ "CANA History". California Association of Nurse Anesthetists. California Association of Nurse Anesthetists. Retrieved January 14, 2017. ^ Childers, Linda (April 29, 2011). "Profile: Alta Alice Miner Bates". Nurse.com. Retrieved January 14, 2017. ^ "Kentucky School of Medicine class of 1893. :: Kornhauser Health Sciences Library History Collections". Digital.library.louisville.edu. Retrieved 16 September 2018. ^ "404 Page Not Found - City of Berkeley, CA" (PDF). Ci.berkeley.ca.us. Retrieved 16 September 2018. ^ "Sisters of Providence - Daring to live our charism in an evolving world". Sistersofprovidence.net. Archived from the original on 2016-03-18. Retrieved 16 September 2018. ^ "Better Health East Bay - Sutter Health". Absfdn.com. Retrieved 16 September 2018. This page was last edited on 26 March 2019, at 10:59 (UTC).